Growing up in Vietnam, a country where poverty presented itself at every corner, I spent my childhood witnessing family members, including my parents, struggle to put food on the table. The urge to act has sparked a sense of purpose in me. On the other hand, my broad exposure to different FinTech industries across the globe demonstrated to me the impact financial tools & services can have on developing communities. This project is a marriage of my two main interests, Social Innovation and Financial Technology. There are over five million underbanked female vendors in Vietnamese markets who struggle to access capital to grow their business. Cơm No Ấm is a women-centric loan service that allows them to gain access to bank loans. The service provides a simple loan application process, fast approval, and flexible repayment options that respond to their need for privacy and convenience. It also empowers them to stay on top of their finance by improving their financial literacy. Compared to other lower-middle-income countries, women are especially economically active in Vietnam [ii]. However, only 30% of 35 million Vietnamese women over age 15 have a bank account [iii], which means 24 million of them don’t have access to formal financial services. Among those, there are more than 5 million female business owners in wet & dry markets, making them one of the biggest underserved segments in the country by financial institutions. Due to the nature of their business, they are always in extreme need of access to more capital. Moreover, with no extra savings, any emergency will immediately put them in debt. They also can not save enough to improve their family’s way of living, ensure education for their children, as well as grow their business. Small-scale market vendors–typically lack collateral and documentation, use smaller amounts of credit. Stable market vendors–women with well-established businesses with stable incomes. Home-based vendors–women in small-scale markets utilizing their house as a stall/small bodega. They have a long-term connection with everyone in the market and the neighborhood. *Notes: Those that work at water and dry markets have some difference in schedules, customer demographics, and service blueprint. Selling veggies at Xóm Chiếu market in District 4 for less than 5 years. She works daily 6-10AM, making an average of $15 in profit a day. Due to not having enough sufficient collateral, she can't go directly to the bank to ask for a loan. Then she finds out that her market has a partnership with a local bank that provides loans to the vendors who are approved by the market management board. She goes to the board and applies for their one-year loan option with an amount of $1,000. There she finds out that she has to pay the board to process her application. In addition, even with her business registration certificate as collateral, she can only borrow a maximum of $600. The disbursement usually takes a couple of days, while she prefers to get access to the capital immediately, ideally on the same day of her application submission. She’s thinking about turning to the loan sharks. Selling rice and snacks at Tân Định market in District 3 for over 20 years. She works daily from 6 AM to 7 PM, making an average of $70 in profit. She needs to borrow $2,500 from the bank and decides to put down her stall lease as collateral for the loan. Even though the bank asks for a lot of legal documents, the process seems easy to follow. It takes a couple of days for her loan to be approved. Although her stall lease is worth $5,000, the bank only lends her $2,000. The payment will be collected in cash daily at her stall by a bank staff. Since she has to pay both the principal and interest each day, she realizes she doesn’t have much left at the end to invest in more inventory to grow her business. Having no or insufficient access to formal documentation, support by local government, credit history, simple savings account, or assets to pledge create high barriers for them to access formal lenders who can offer them better and cheaper loans. Above of all, loan is considered as a taboo in Vietnam. Nobody wants to be seen borrowing money. That’s why helpful financial resources & educational information don’t get shared out. Without knowing any better options, they are then forced to turn to illegal peer to peer lending activities or loan sharks that take advantage of their desperation. Interest rate–This is their biggest concern, especially those who work in areas that are surrounded by loan sharks. That prevents them from trusting new services. Repayment plans (they hope to have enough capital left to invest in their business after each repayment). Threats from debt collectors (most of them are mafia). They don’t want anyone to know that they are borrowing money due to competition and it’s a taboo in Vietnamese culture. They don’t like to be in debt and only spend what they earn. They don’t have a bank account but some have a portfolio of non-bank savings methods that work for their goals. Those savings tend to be small. When they have extra income, they will buy either more inventory or home supplies for their family. Those who have gambling issues often get high-interest loans from loan sharks. The majority of them are smartphone users but not tech-savvy. Zalo and Facebook are their most popular social and messaging platforms [v1, v2]. They prefer to call (with a non-smartphone) than texting (with Zalo). Only banks can legally provide loan service. They have been doing a lot of outreach to this community lately by making the application process less complicated and sending their agents to the markets talking to the vendors directly. However, they still set a large number of constraints on short-term microloans due to their high-risk, and the process is still slow. Some market management boards provide low-interest loans to low-income vendors but the amount is insufficient (less than $1,500). Loans by Fintech companies (backed by banks) provide quick disbursement but come with high rates, hidden fees and small amounts that don’t make much impact on their business. They are then forced to turn to loan sharks that take advantage of their desperation and time-sensitive need, or illegal peer to peer lending (P2P) activities that often lead to one subscriber breaking the group’s trust and running away with the money [iv]. Being often abused by the local government, the vendors tend to solve their financial problems with each other, instead of reporting them to the management board. Loan repayments are collected daily at the stall in cash by a bank staff. Banks always buy insurance for this type of loans in case of a disaster at the market, or the borrower’s permanent disability or death. There’s no financial product that only focuses on women. Vay Nhanh VPBank, Sacombank loans for small business, medium business. Most require collateral or formal documentation. To test if the audience will find the value prop around an easy loan application process compelling for Tết (Lunar New Year). Designed a brochure introducing a community project to help the female vendors search for the best loan options in the market, and if they were interested and wanted more information, they would text a Zalo number (Zalo is currently their most popular messaging platform). If you are this & you need this: If you are female business owner looking for easy loan options that meet your unique financial needs and don't require documentation or collateral you don't have. How we help you get what you need: US blue will help you find the best loan options in the market. Who are we & why we care: USblue is a research organization based in the US that specializes in microloans in Vietnam. Since Vietnamese women are the most underserved and unserved market by financial institutions, we decided to turn our 23-year database to a (Social project’s mission) community service that helps female small business owners make informed decisions on which loan they want to get. How it works: Text SIGNUP to this number to get more information. A team member will text you back within 24 hours to start your loan search. Why you should care: It’s a sponsored program so it’s free. It helps you save time, avoid scams and get the best options. Disclaimer: This service is in beta testing at this time. Client’s testimonial: “Tết is approaching and I was concerned about where to get sufficient capital to invest in more inventory. Thanks to USblue, they helped me get a good quality loan that came with insurance, low interest without requiring too many documentations. Now I can focus on preparing for Tết!”–Miss D., a vendor at Hoà Hưng market shared. Cơm No Ấm offers banks a loan product that lowers the risks of unsecured loans and customer acquisition costs, as well as optimizes their lending process allowing them to reach their ideal prequalified unbanked & underbanked population of female small business owners. Partnering with Trusting Social, a FinTech firm based in Vietnam. Their core technology, Alternative Credit Score, is to help banks and financial institutions speed up the underwriting process by providing their customer’s credit score based on the data collected from their phone number. They are currently scoring ~800 million users in Asia. To design the right loan products for them by understanding their unique financial capabilities, needs, and behaviors. Collaborated with data scientist Mio Khanh Luu to design loan packages tailored to target user needs with data collected from 91 survey responses & competitive benchmark analysis. 72% of them needed loans in the next 3 months while 35% said that they got loans fewer than once a year. Additionally, the survey was sent out around November and December. › Demand for loans peaks 3 months before Tết (Lunar New Year), the biggest national festival that happens around February every year. 77% preferred interest to be charged on the unpaid principal balance (instead of on the original principal balance). Analyzed case studies shared by Women’s World Bank to apply their insights on this specific local context. Apply gender-inclusive design (For example, since women place a high value on the opinions of peers [vi], the service will emphasize on-boarding more women through referrals). Apply women centricity in the branding and marketing of the service. Train client-facing staff to serve women with these products, thus making financial services accessible to women. Make help always available with field staff hiring (part-time opportunities for college students) to run information and sign up kiosks at the markets. Engage at every interaction to reinforce marketing and women-focused messaging, get them to TRUST and SIGN UP for the service by understanding their common challenges and needs (transparency, security, prosperity), and how information is shared and verified in their communities. Facilitate support groups for them to keep each other accountable and motivated. How to outreach and introduce them about the new loan products and service? How to build trust? How to onboard them, help them understand the process and how to use the products? How to develop digital financial tools for non-tech-savvy users based on their financial literacy? Most users are in their middle ages and not used to reading small fonts on mobile devices. Core Values: Privacy, security, and prosperity. Market Adoption Plan: Customer teams are sent to approach the users at the markets to introduce the new service and onboard them onto the app. The teams are equipped with a conversational guide and leave-behind materials. Once the user has installed the app, the new credit scoring technology allows her to find out how much unsecured loan she can borrow up to. All she needs to do is to provide her phone number. To respond to the user’s time-sensitive need, it takes only 20 minutes for her to get pre-approved. She then comes to a nearby bank with a valid ID to sign the paperwork and withdraw the cash loan. The app also comes with loan tools & unique features to help the user stay on top of her loan management. Women place a high value on the opinions of peers. 1. Gain trust by seeing other female vendors’ testimonials. 2. Instructional videos of how to use the service. 3. The help feature is placed strategically on the navigation bar, where they find out that they can either call or access the service at the comfort of their home (by having our staffs come over). Nowadays, by getting more comfortable with digital technology, most of the vendors are smartphone users. That makes it possible to integrate our new credit scoring technology that allows them, at their fingertips, to find out how much they can borrow without the need to submit any collateral or documentation. All they need to do is to provide their phone number, verify it then wait for 20 minutes. To make the application process as simple as possible, I focus on minimizing the friction by only asking for the user’s information when needed. As a first time user, they are only prompted to set up their profile either while waiting for the result or in between steps of the loan application process. So they doesn’t feel like giving out personal information until she sees the value of doing that. Based on the survey results, Tết (Lunar New Year) is the most crucial selling opportunity. Around three months before the holiday, all the female vendors start to buy as much inventory as possible cause they believe that they will make the most profits of the entire year during Tết. › The loan products leverage a relatively small loan amount into a big impact within their businesses. 77% of 91 survey participants preferred the interest to be charged on the unpaid principal balance since that allowed them to have more savings to grow their business in the long run. › The repayment method accommodates their financial needs. By considering all the phases of the user’s journey. Option to choose a bank at a convenient location to withdraw the cash loan. › Much safer since they don’t have to carry a pile of cash around. *Note: Loan contracts have to be signed in person to be considered legal in Vietnam. Option to pay loans at the same vendor where they usually go to pay their utility bills. Be proactive about where and when to make the payments. Avoid being seen borrowing money due to competition. It’s also a taboo in Vietnamese culture. The loan repayment collection options aim to provide the user convenience and privacy. Each loan comes with a unique QR code to support offline interactions and provide instant updates on the system. When I first started designing Cơm No Ấm, the goal was to make good loans accessible to the female market vendors by erasing all the barriers. Later, I came to realize, to make a stronger and longer lasting impact, the service has to empower those women small business owners to stay on top of their finance by improving their financial literacy. 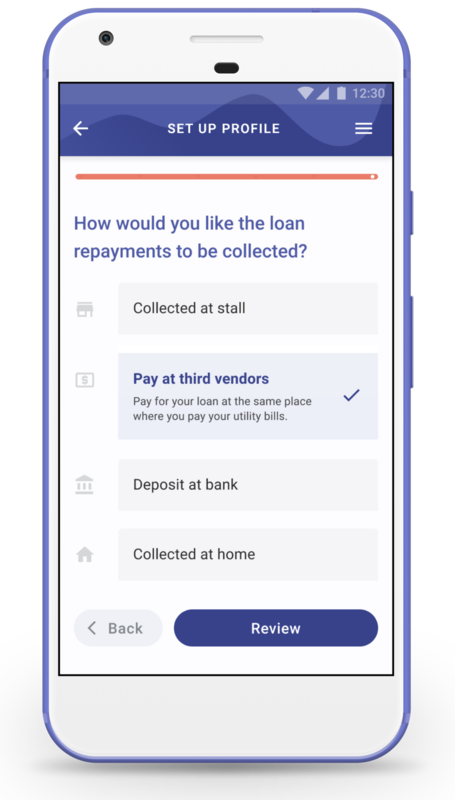 The user can access to the loan tools (1) that come with the app, as well as educational content (2) relevant to their financial needs to help them stay on top of their other loans. The whole service experience is about setting a financial goal, tracking it & eventually achieving it. This loan progress tracking screen is very powerful. They see what goals they are pursuing, where they are, & what they need to do next. Those normally would be handwritten all over the place in their notebooks. Loan now becomes a financial goal. We let them know what happens if they miss the repayment deadline (1). But the main focus is to equip them to be successful financially by giving words of encouragement whenever then make good progress and celebrate them with rewards (2). When they paid off a loan, they unlock a higher loan amount. It means that their credit score gets improved. So by using CNA over time, they go from zero credit history to gradually building a traditional credit score which opens them up to many more financial opportunities. Providing the economically active but financially underserved women small business owners in emerging markets like Vietnam with financial services like Cơm No Ấm can benefit their families, communities, and unlock economic growth through out the entire country. With a high adoption rate to digital technology (smartphone usage, mobile payments etc), it’s a valuable chance to introduce them to digital financial services. That will also help the bank track loan payments (Tracking loan ID is one of the biggest issues banks in Vietnam are facing right now). Automatically opening savings accounts when they sign up for loans. Encourage the act of savings and build that habit. Help them stay on top of their financial management by informing them about their credit score and loan capacity. Monitor and evaluate performance over time.